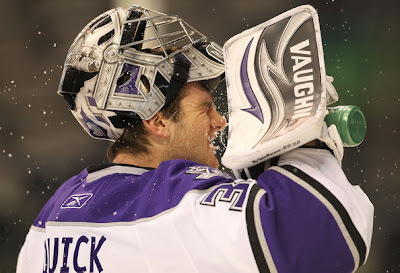 The Kings kick off the second half of their season today when they face the Columbus Blue Jackets. Through the King's first 41 games there has been nothing more apparent than the the team's struggle with offensive production. As the Kings start the second half of the season they have the league's lowest goals per game average at 2.07, and have scored 85 goals on the season, also the lowest total in the league. Despite the team's inability to find the back of the net, they find themselves one point out of first place in the Pacific Division, and in seventh place in the Western Conference. They have avoided the league cellar due to the stellar play of Kings goalie, Jonathan Quick. Going into today's game, Quick has played 34 games and recorded 18 wins in those games. He leads the league with six shutouts, and boasts a 1.95 goals against average, the sixth best in the league. The fact that the Kings have scored so few goals on such a consistent basis has forced Quick to be the best King on the ice each time he is in the crease. If Quick had started the season slow and not been on his game, the Kings could very easily have found themselves far down the standings at this point of the season.